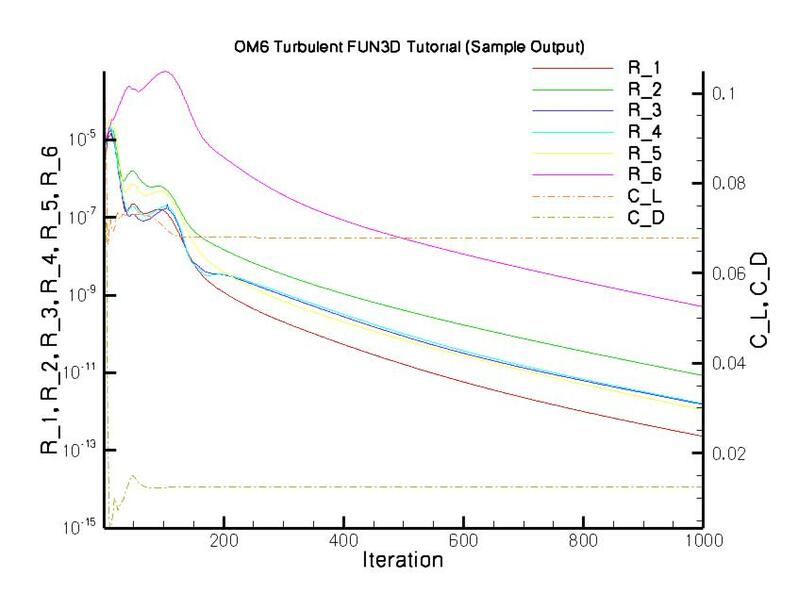 FUN3D is a Computational Fluid Dynamics (CFD) suite of tools actively developed at NASA that benefits Aeronautics, Space Technology, and Exploration by modeling fluid flow. Please note that in addition to the tutorials contained here, there are a number of additional resources available in the Training Workshops area of the site. Video footage from approximately 15 in-depth training sessions over a 2-day period are available for viewing. These sessions covered all of the major application areas of FUN3D at the time they were produced. This tutorial will describe how to set up and obtain a coarse-grid inviscid flow solution with FUN3D v13.3. All the grid and input files may be downloaded as described below. Note that the grid for this case is very coarse and is intended for demonstration, rather than accurate aerodynamic analysis. The geometry consists of a stand-alone ONERA M6 (OM6) wing with a symmetry boundary condition imposed at the wing root. The reader should be familiar with the flow solver inputs (See FUN3D Manual: Appendix B FUN3D Input Files). (See FUN3D Manual: Appendix A Installation). The namelist file, fun3d.nml, is used to control the execution of the solver (initial conditions, physical models, etc.). The following is a very simple example for basic execution. There are more aggressive strategies available, but this will be sufficient to get started. This example namelist file relies on defaults and only modifies values relevant to this case. 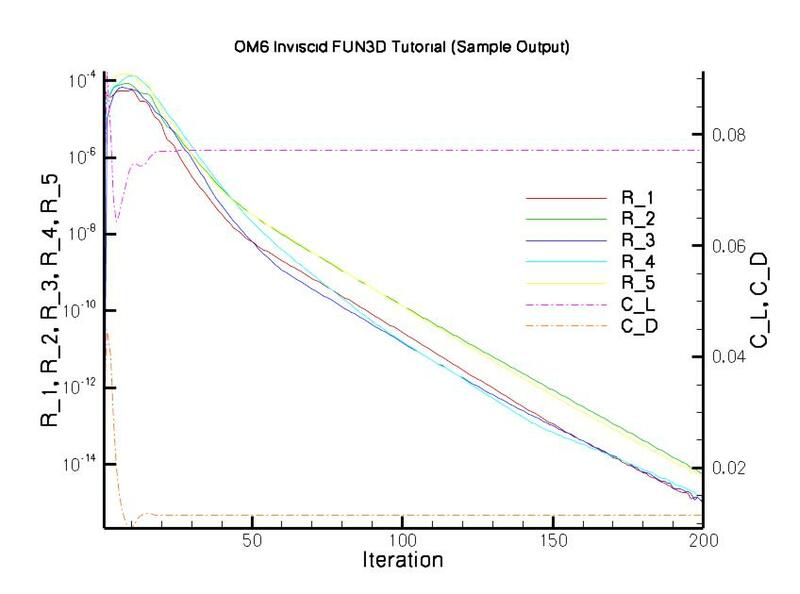 case_title = "OM6 Simple Inviscid Flow Solve Tutorial"
Although not necessary, we will assume that the flow solver executable (nodet or nodet_mpi) has been installed in your search path to simplify the discussion to follow. Therefore, we will not reference an explicit path to the executable, but instead simply invoke directly like any other installed software. For parallel (multiple-processor) execution, the flow solver is invoked through an MPI command like mpirun, aprun, or mpiexec depending on your local environment. It is assumed that your system is configured for some implementation of MPI and that all processors have access to the case directory and to the nodet_mpi executable. The figure below is a representative convergence history for this case. The residual information is available in the file om6inviscid_hist.dat and is in the Tecplot format. The residual values (R_1, R_2, R_3, R_4, R_5) represent the convergence of the 5 equations of state (mass, x-momentum, y-momentum, z-momentum, and energy, respectively). They are plotted using a Log scale below. The Tecplot surface visualization file om6inviscid_tec_boundary.dat is the result of the --animation_freq -1 command line option. This file contains the primitive variables on each solid boundary surface. Note: This file may have a .plt or .szplt suffix if your FUN3D is configured to use the binary Tecplot I/O libraries. This tutorial will describe how to set up and obtain a coarse-grid turbulent flow solution with FUN3D v13.3. All the grid and input files may be downloaded as described below. Note that the grid for this case is very coarse and is intended for demonstration rather than accurate aerodynamic analysis. The geometry consists of a stand-alone ONERA M6 (OM6) wing with a symmetry boundary condition imposed at the wing root. 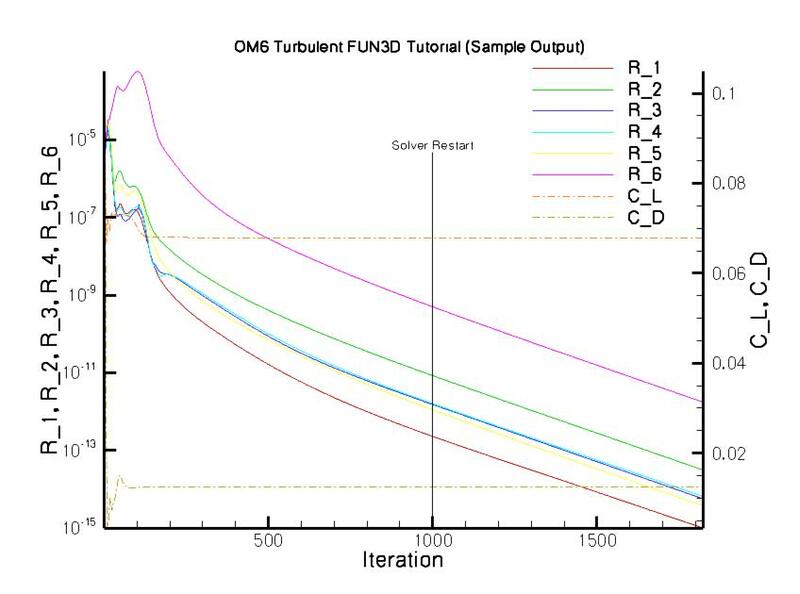 case_title = "OM6 Simple Turbulent Flow Solve Tutorial"
The resulting convergence history is shown in the following plot. Execution of the flow solver using the above FUN3D namelist is conducted in the same manner as for the initial invocation. For example, parallel execution is invoked through mpirun as before. The following is a representative convergence history for this case. 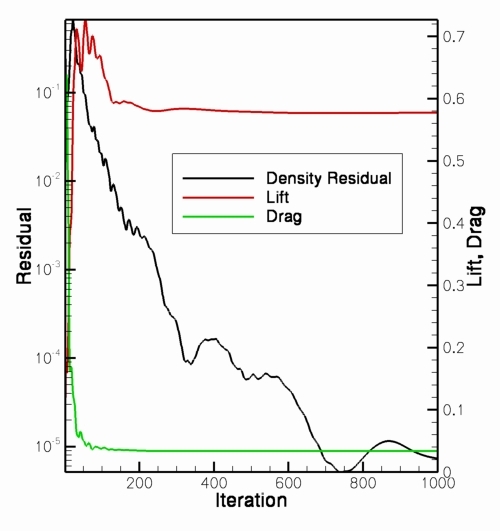 The residual information is available in the file om6viscous_symmetry_hist.dat and is in the Tecplot format. The residual values (R_1, R_2, R_3, R_4, R_5, R_6) represent the convergence of the 5 equations of state (mass, x-momentum, y-momentum, z-momentum, energy, and the 1 Eqn. SA model respectively). They are plotted using a Log scale below. The result of the above execution will also generate the Tecplot file om6viscous_symmetry_tec_boundary.dat for examination of solid surface quantities. This tutorial will describe how to merge a tetrahedral VGRID mesh into mixed elements and execute a turbulent flow solve using FUN3D v13.3. The grid and input files for this example are from the AIAA DPW-2 workshop and can be downloaded as described below. Note that the grids for this case are very coarse and are intended for demonstration rather than accurate aerodynamic analysis. The geometry consists of a wing-body configuration with half-plane symmetry. Note that you need the .poin1 file for merging the grid—normally this file is not required to process the raw tetrahedral grid. As with previous flow solver tutorials, a fun3d.nml namelist file is used to control the execution of the solver (initial conditions, physical models, etc.). The following is a very simple example for illustrative purposes; more advanced strategies are available but not covered here. case_title = "Merged DPW-2 Tutorial"
Although not necessary, we will assume that the utility code vgrid_merge_into_prisms executable and flow solver executable (nodet or nodet_mpi) have been installed in your search path to simplify the discussion to follow. Therefore, we will not reference an explicit path to the executable, but instead simply invoke directly like any other installed software. Note f6wbnc.merged.mapbc contains family info. Note f6wbnc.merged.lines_fmt contains implicit line info. The program will merge the grid and dump some statistics to the screen. In this case, the number of tetrahedra was reduced from 6,558,758 to 3,039,656 while 1,172,171 prisms and 7,337 pyramids were introduced. The total number of nodes in the mesh went from 1,121,301 to 1,123,718. The result of the merging process is a stream AFLR3 .b8.ugrid file with the same project name as the original grid but with a .merged extension. It is advised that you do not change this new appended project name. The resulting convergence history is represented in the following plot. You may also view the resulting f6wbnc.merged_tec_boundary.dat file with Tecplot. 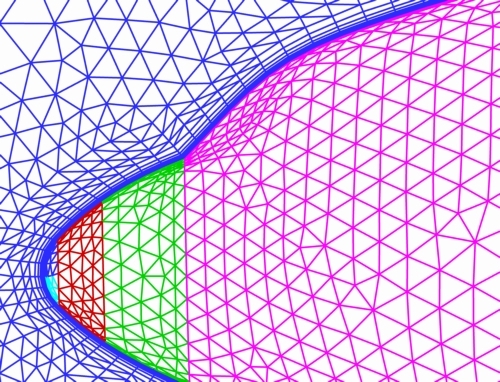 Zooming in on the symmetry plane, you will see that the triangular faces have become quad faces, indicating that the boundary layer grid now consists of prismatic elements. This material is declared a work of the U.S. Government and is not subject to copyright protection in the United States.